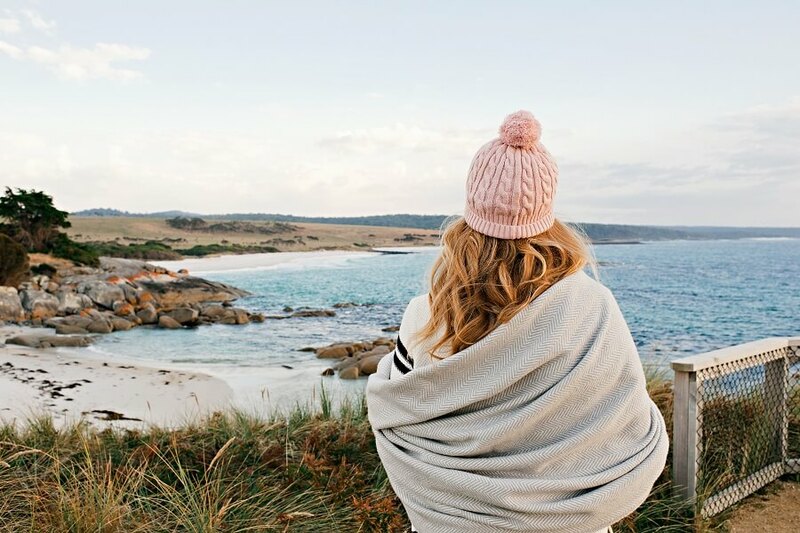 Visit world-famous Wineglass Bay, watch Little Penguins waddle up the shore, and marvel at the beauty of the Freycinet Peninsula on this 2-day adventure through Tasmania’s east coast. This tour includes transfer from Hobart to Launceston to meet our 2 Day Tasmania Tour with Wineglass Bay. It includes dormitory accommodation in Launceston on the first night before joining the rest of the tour group for the second night. If you prefer to make your own way to Launceston and would like to join our 2-day tour, please click here. Meals and food are not provided, however, there are opportunities to purchase food from supermarkets, cafes or restaurants. All accommodation we stay in have kitchen facilities to prepare for your food, or alternatively, there’s an option to eat out if you prefer. Travellers with very specific dietary requirements are advised to purchase specialised items in Hobart before the start of the tour as food options may be limited in regional areas. Luggage is restricted to a maximum of one 20kgs backpack/suitcase and one hand luggage size bag per person. Comfortable shoes to walk in, warm clothes for the mountains, light clothes for the beach, rain jacket or umbrella, large water bottle, and camera with LOTS of memory and battery. You do not need to bring a sleeping bag, sleeping linen will be provided. Meet the Hobart to Launceston transfer coach at Redline Transit Centre at 2:45pm on your departure date. You’ll arrive in Launceston at 5:30pm, where you can check into your dormitory accommodation for the night, ready to meet the tour on the following morning. The tour kicks off with a drive to Legerwood, where you can witness the incredible memorial carvings and tuck into some cheesy treats at the Pyengana Dairy Company. Afterwards, we’ll head on to the Bay of Fires. Here, you can experience some of the whitest sands and most glistening waters in the world, and you’ll have plenty of free time to take a stroll along the sands or take a refreshing swim in the shallows. If you’re feeling peckish, tuck into freshly-caught oysters at nearby St Helens. 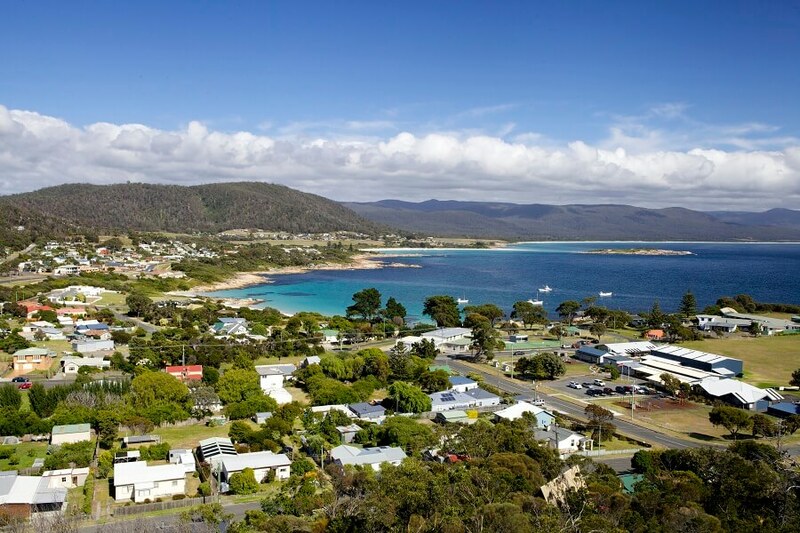 We’ll then go to the charming seaside town of Bicheno where we’ll be spending the night. Before you turn in, though, you’ll get to watch the resident Little Penguins waddle up the beach after a hard day’s fishing. On the morning of day two, you can choose to go to East Coast Natureworld, a local wildlife sanctuary, to spot native critters. 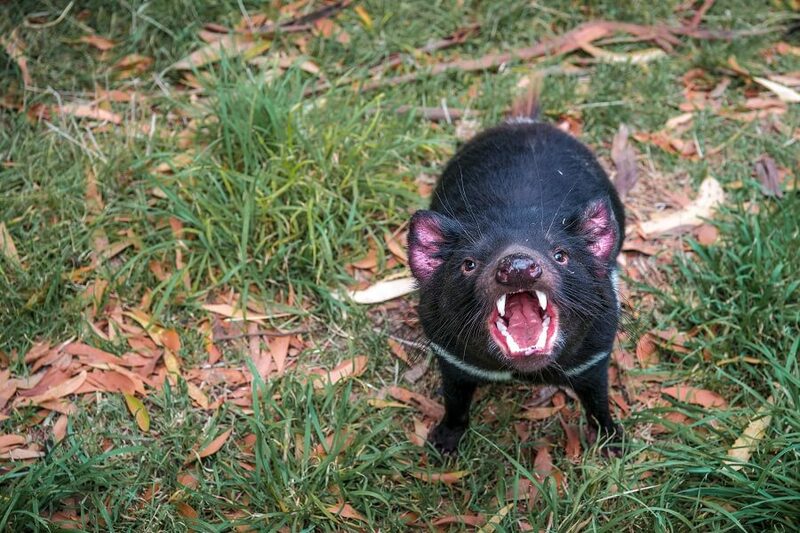 You’ll be able to watch the kangaroos, wombats, koalas, and Tasmanian Devils at feeding time for an extra cost. 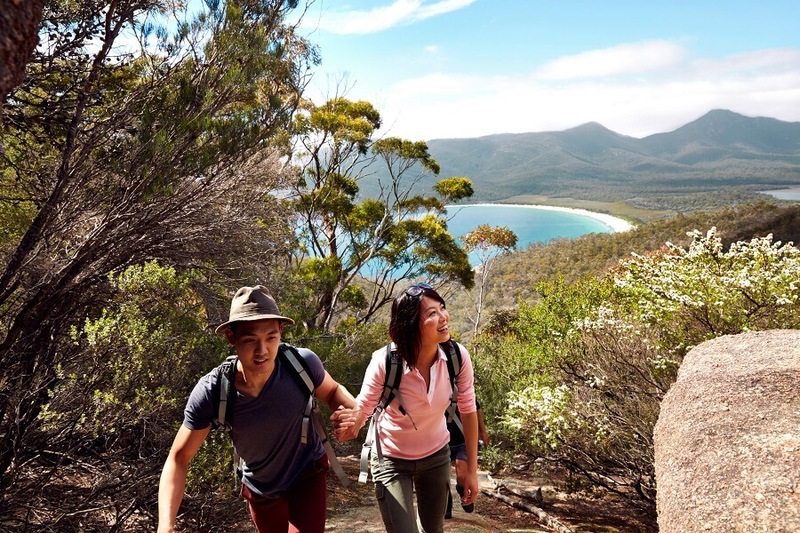 Afterwards, we’ll grab a picnic lunch at Wineglass Bay in the beautiful surrounds of the Freycinet National Park before taking a walk to a nearby lookout for spectacular views. 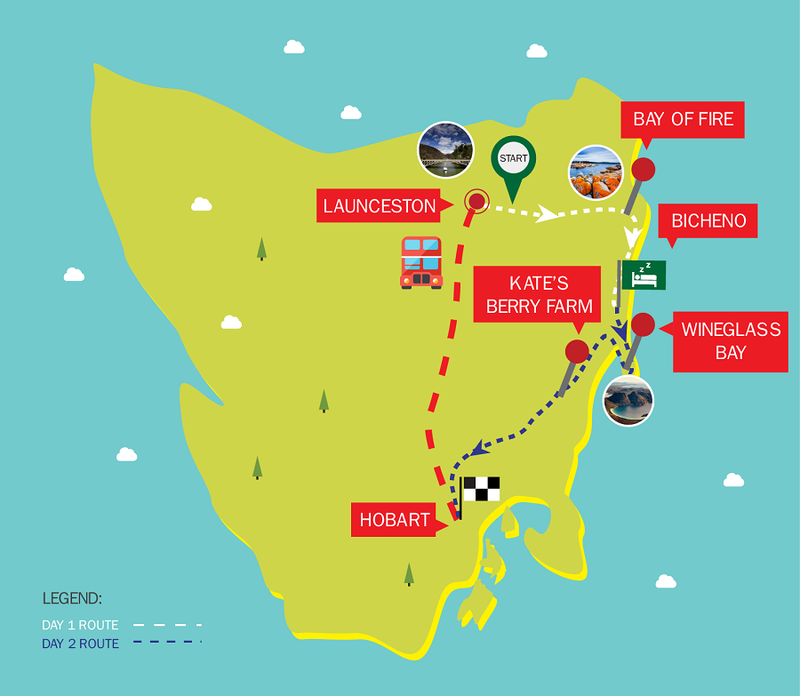 In the afternoon, we’ll make our way down the Great Eastern Drive back to Hobart, stopping on the way at Kate’s Berry Farm in Swansea for a cup of tea. Please arrive at the Redline Transit Centre at 2:45pm for a 3:00pm departure to Launceston. You will be staying at the Launceston Backpackers and will be collected at 8:00am the following morning to join the tour.